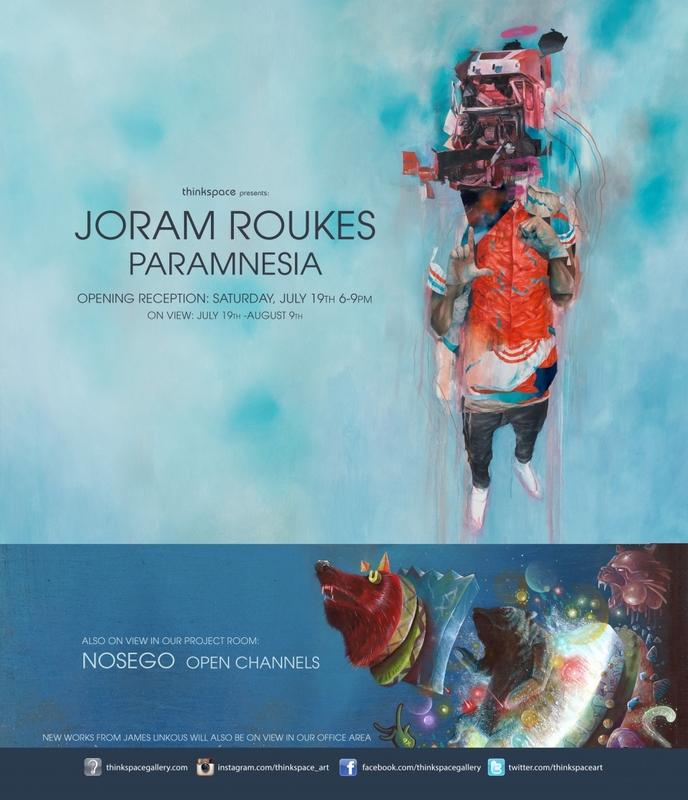 Thinkspace (Los Angeles) – is pleased to present new works by Dutch artist Joram Roukes in Paramnesia. Roukes has been residing and working in Los Angeles over the past six months, drawing inspiration from his time spent in the city for this new body of work. Combining imagery distilled from the observed and the imagined, the artist’s paintings invoke a schizophrenic contemporaneity colonized by both disaster and desire. Roukes’ works present us with fractured identities and chasmic experiences: frayed realities ambiguously dramatized through the aberrations of fantasy. 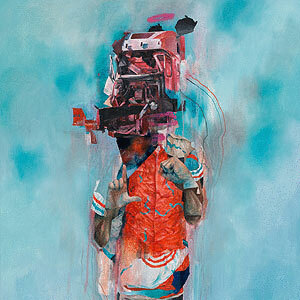 Part human and part animal, his subjects are anonymous symbols in service of metaphor. His superimposition of the animal onto the figurative keeps his subjects symbolic, proverbial even, rather than specific. The abrupt collage-like painting style is unmistakably his own: a graphic and painterly combination of free associations to link disjunctive images and disparate parts. Through a dizzying aggregate of realist and expressionistic painting styles, the artist visually invokes the palpable cultural tensions he explores conceptually. Roukes’ highly stylized imagery is poetically jarring, at times miasmic and dark, but always critically compelling. Invoking the irreconcilable contradictions of Western culture, particularly in its competing impulses to simultaneously destroy and romanticize, Roukes deftly points to the misguided optimisms and inevitable tragedies left in its wake. Paramnesia refers to a phenomenon whereby the perception of realities both observed and imagined are inextricably bound. Through a subjective process of recall, memory becomes a complex mirage of juxtapositions and imaginative distortions – the real is subsumed by the imaginary, making the two virtually indistinguishable. Roukes explores this concept throughout this new body of work, combining fragments of the real with the limitless associations of dream and fantasy – morphing the one into the other. The subjective deceit of memory is not unlike the hallucinatory excesses of the cultural paradigms Roukes explores. The artist seems to suggest that contemporary consciousness is subject to the motives of its adopted imaginaries, and reality, it seems, is inextricably bound to the dream. Looking to his personal experiences over his prolonged residency in Los Angeles, Roukes combines the personal with the observed in a way that implies the impossibility of their separation. The works are like haunting apparitions: entirely new and yet eerily transmuted from the familiar to the strange. We are shown a world uncomfortably strung somewhere between disaster and dream, and the ideological and the personal; an unresolved interstice that begs the viewer to participate in its critical exploration. Ultimately, Roukes’ dialogic works are open-ended narratives rather than finite statements: there is room within their surreal recesses to project and infer.